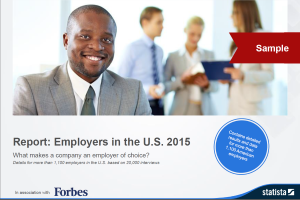 What makes a company an employer of choice? Based on over 20,000 employee interviews, this report contains detailed results and data for more than 1,100 American employers. For the first time Statista.com, in partnership with Forbes, surveyed over 20,000 American employees in order to analyze who the best employers in the U.S. are and understand what drives American employee satisfaction. Would you like to order the report without registration? OverviewFor the first time Statista.com, in partnership with Forbes, surveyed over 20,000 American employees in order to analyze who the best employers in the U.S. are and understand what drives American employee satisfaction. Using online access panels, Statista.com and Forbes have anonymously and independently surveyed over 20,000 American employees. Based on the results of this survey, over 1,100 employers from 25 industry sectors have been given a score. The report contains 3 documents: a comprehensive professionally presented PDF data file as well as two professionally compiled Excel files. The PDF data file contains a presentation of various results. In addition to the employers’ individual scores and rankings, all drivers of an employer’s attractiveness are analyzed and presented for all 25 industry sectors and by region, sociodemographic characteristics, etc. Furthermore, the document contains recommendations to increase employer attractiveness. The first Excel document contains all individual scores, driver values and additional information for over 1,100 employers. The second Excel document contains all 6 driver values by sociodemographic characteristics (age group, gender, level of employment, etc. ), and by industry sector.